Talking about money can be taboo, right? But churches have to do it! Avoid making these 10 big mistakes in your church when having the money talk. Here's the deal: Talking about money is tough. There are a lot of feelings and issues to navigate. Having the money talk is tough. Due to all these issues, it's inevitable that you're going to make mistakes when you talk about money. You’re going to fumble your words, say something you regret, or totally forget what you meant to say. You're going to tip-toe around the point, sugar cote it, drill the point home too harshly, or simply not speak with conviction or confidence. But even though you’re going to stumble along the way, you can plan and prepare to avoid making common mistakes when it comes to talking about money in your church. Being aware of these potential pitfalls will help you to avoid walking into them and falling on your face. I know it’s not fun to talk about the things we get wrong. But I hope is to shed some light on your path as you talk about money in your church. Not talking about money with your church is similar to not warning someone of impending danger. I understand this topic is uncomfortable for many pastors. But talking about money is essential to equipping the members of your church to live out their faith in Christ. Besides, God has a lot to say about money in the Bible. There are more than 2,000 scriptures on tithing in the Bible, money, and possessions in the Old and New Testaments. That’s double the number of references to faith and prayer combined. Wowzers! God has a good reason why he spends so much time talking about money. Money will be one of the fiercest idols you face in your relationship with God. In the words of Jesus, “You cannot serve God and money" (Matt. 6:24). God desires our devotion, and he knows that you and your church will be tempted to devote yourself to money instead. Avoiding this conversation in your church will do a great disservice to your people. The way money affects the people in your church will vary case-by-case. A wealthy member of your church may sense a level of pride and independence from God because they don’t need anything. A member of your church struggling financially may be tempted to doubt God’s goodness. A middle-class member of your church may be tempted to covet a bigger house, newer car, and more income. Regardless of the struggles or temptations your congregation faces with money, lead your church to manage their money in such a way that glorifies God, is good for others, and is beneficial for him or herself, which leads me to the next point. No one expects pastors to double as financial advisors. When it comes to preaching about money in your church, fight the temptation to share general financial advice alone. The members of your church want to know what God says about money, how they should steward their resources, and how God can redeem their financial situation if they’re in trouble. Be bold when you talk about tithing in the Bible, giving, and generosity. Know that the Lord is at work in the life of your church and that when you share what the Bible has to say about money, you will lead your congregation to experience the grace of God in their life when it comes to their money management. Now, outside of your pulpit, it’s a good idea to consider providing additional financial coaching through courses like Financial Peace by Ramsey Solutions. Leading your church to become generous givers will require more than one sermon about tithing in the Bible or a sermon series based on stewardship in the Bible. Building a generous church culture will revolve around whether or not you regularly preach the gospel. The gospel is more than a message for non-believers. It’s a message we need to hear regularly. This is one reason why Paul wrote a letter to the churches of Galatia (Gal. 1:1-3). So, If you want to build a generous church culture, then preach the gospel. Remind your church that Jesus has given them new life. Regularly let them know that Jesus paid the ultimate sacrifice so that they would be forgiven of their sins, receive his perfect righteousness, and become children of God. In time, as you preach the gospel and lead people to meet Jesus, you will see your church members respond to his generosity by being generous themselves. God is at work in your church. He is giving people new life in Christ. He is transforming people into the image of Jesus. He's restoring marriages, changing lives, and building his church. As a pastor, you have a front row seat in observing God’s work in the life of your church. But most of the members of your church will have no idea how God is at work unless you tell them. Sharing stories will illustrate God’s tangible work in the lives of people. The stories you share will encourage people to know that they are participating in God’s work by financially supporting the local church. You know what’s not exciting? Whether you’re taking care of your family’s finances or reconciling your church’s financial statements, taking care of your bills isn’t exhilarating. Unless you’re casting a vision of the work God has called you and your church to accomplish, your congregation will not sense a calling to participate in the work of the church. The members of your church will give as the Lord leads them. But, by painting a picture of how God is at work in and through your church, you’ll be able to help your congregation see that their financial sacrifices are supporting God’s work. What is God leading you and your church to do in your community? Has the Lord compelled you to support missionaries around the world? Have you baptized new people? Is participation in your community groups increasing? Have marriages been renewed in your congregation? Take time to reflect on God’s work in your church, and share these stories with your congregation. Casting a clear vision and showing people how God is at work is one way you can inspire people in your church to give. Asking for money isn’t easy. Regardless if you’ve been pastoring for years, you probably feel a tinge of anxiety when it comes to asking people to donate. But here’s the deal: If you don’t ask people to give, then most people won’t give. Would giving in your church decrease if you never took up an offering? What if you never encouraged people to use your church giving app? Would giving decline? Yea, some members of your church will donate regardless if you ask them or not. But many of the members of your church may not give for a variety of reasons. At the end of the day, you have to invite the members of your church to participate in God’s work by financially supporting the work of the Church. Instead of asking people to give, invite them to respond to the grace of God in their lives and to participate in the work of God in your church. In the words of the apostle Paul, “But since you excel in everything—in faith, in speech, in knowledge, in complete earnestness and in the love we have kindled in you—see that you also excel in this grace of giving” (2 Cor. 8:7, NIV). It’s wonderful when you have new guests visiting your church’s worship service. They’ll have an opportunity to hear the gospel, meet someone new in your church, and possibly get connected. Every week, make it a habit of acknowledging visitors during your offering time—even if no one new is visiting you that day. Let visitors know that they’re not obligated to give. Make them feel comfortable to pass the offering plate or keep their phone in their pocket so that they don’t feel guilted into giving. You may have some visitors give during your offering, and that’s okay. Just let them know that the offering time in your church is a family thing for your church members. As a church leader, it can be easy to forget about expressing gratitude. The offering time in your worship service can become a task to accomplish, and remembering to say thanks can slip your mind. Expressing a lack of appreciation is usually a result of forgetfulness or a broken system. In other words, if you don’t have reminders in place to say “thank you” during your church's offering or an automated system that sends a thank you note when someone gives online. It’s essential to express thankfulness to the members of your congregation who support your church financially. Regularly expressing gratitude will help you to set a tone of appreciation in your church. This mistake catches people typically off guard. I mean, we’re not supposed to show favoritism to wealthy people, right (James 2:1-13)? But that’s not the mistake I’m talking about. What I’m talking about is not speaking into the unique challenges wealthy people face. You see, it’s difficult “for a rich person to enter the kingdom of God” (Matt. 19:24). Whether it’s their status, power, or possessions, a wealthy person may not see their need to place their faith in Jesus Christ. As for the wealthy members of your congregation, as a pastor, you're charged to challenge them to set their hope on God—not their money or possessions (1 Tim. 6:17). What is more, you are to encourage the affluent members in your church “to do good, to be rich in good works, to be generous and ready to share, thus storing up treasure for themselves as a good foundation for the future, so that they may take hold of that which is truly life” (1 Tim. 6:18-19). As a pastor or church leader, you may feel intimidated to spend time with the wealthy members of your congregation or want to avoid giving the impression of showing favoritism. But receive your call from the Lord to speak into their life to help them live and love like Jesus. Do you regularly let people know how they can give? This question may seem obvious. But you’d be surprised by how many churches fail to regularly let people know about the different ways they can give. When promoting giving in your church, you don’t need to orchestrate a light show or drop balloons from your ceiling. All you need to do is to let your congregation know how they can give. For example, during your offering, you can quickly let people know they can give with cash or check or use mobile giving or an online giving option. Also, review your church’s communications to make sure you’re at least letting people know how to give. You don’t have to include a direct promotion every time. But it’s a good idea to at least add a short blurb about giving in your communications with your church. Reading these types of posts can feel like a punch in the gut. In this post, it’s like getting hit 10 times over-and-over again. Not fun! Have you made a mistake talking about money? Well, I wouldn’t be surprised. Everyone has (at least the people who are being honest). In the end, don’t spend too much time navel-gazing. That’s not going to help you to move forward. Instead, focus on ways you should talk about money in your church. In case you missed, here’s a helpful post that will clear the way: How to Talk About Money in Your Church: 5 Things to Keep in Mind. Women compose the majority of churches and manage the majority of checkbooks. But we often fail to think about how to help them give. Here's a proven 5-step approach. Get a breakdown of over 100 Bible verses about tithing in the Bible, generosity, and offerings. Blue Monday is considered the most depressing day of the year. Here are six ways you can beat the blues today. What if everything you know about the connection between church and money is wrong? How you manage donors is essential to your church's well-being. Here are five easy ways you can manage your givers. A first-time donation is a big step for someone to take with your church. Here are five ways you can build a relationship with a first-time giver. Is it better to give than to receive? Here are six biblical and scientific reasons why giving is better than receiving. Discover how this 122-year old Lutheran Church increased giving nearly 15 percent. Here are seven trends in charitable giving your church can expect in 2019. Need help preparing giving statements for your church? Here's how you can take this opportunity to remind your church about the faithfulness of God. Brad Formsma, author of "I Like Giving," talks about the transformative power of living your life as a gift. End of year giving is HUGE for churches and nonprofit organizations. Here are five ways you can increase your year-end giving. Year-end giving is a crucial time for your church. Here are 10 ways you can maximize end of the year giving in your church. Is your church ready for end of year giving? Here are 5 must-know stats. Church finances are a regular source of stress. But here are 5 ways you can combat this stress and take control of your situation. Does your church need help with #GivingTuesday? Here are 8 tips you can use today. Text-to-give is a fast, secure, and essential giving option you should provide your church. Are Church Donations Tax Deductible? Are church donations, tithes, and offerings tax deductible? Find out the answer in this short guide. A generous church culture isn't created by accident. There are four simple steps you'll need to take. What are "treasures in heaven"? Let's take a look at one Jesus' essential teachings in Matthew 6:19-21. What is first fruit? What is the difference between first fruit and tithes? Find out these answers and more in this short guide. Check out these church offering statistic results from a survey we conducted of over 1,000 church leaders. It’s easy for your church’s budget to start leaking money. Here are 4 ways your church is wasting money or overspending. Chris Sonksen, author of "Quit Church," shares three ways giving is good for you. Ed Stetzer and Daniel Im share 8 church plant fundraising models you can use to raise financial support for your church plant. Does your church financial situation keep you awake at night? Need help raising additional funds? 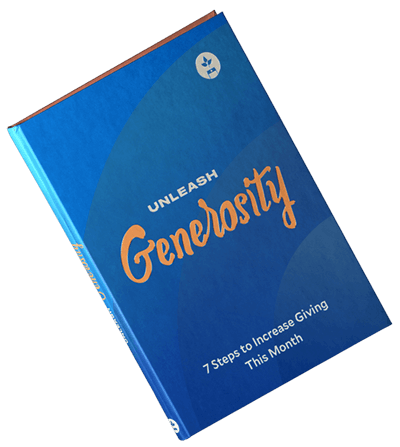 Download "Unleash Generosity" to increase giving this month. Need to raise financial support for your church or special occasion? Here are 12 proven church fundraising ideas you can use. Need help writing the perfect church donation letter? Here are 5 sample donation letters you can copy and paste. Fundraising software isn't confined to multi-million dollar organizations. There are tools in donor software every church and ministry can benefit from. There are roughly 2,000 Bible verses about money and possessions. But here are 9 practical principles you need to know. Check out this list of sermons on giving and generosity from a variety of pastors. Here are five actionalbe lessons pastors can learn from the Giving USA 2018 Philanthropy report. Capital campaigns aren't the right tactic for every situation. Rusty Lewis from Generis shares an alternative solution to increase giving. Improving your online giving page is an easy way to encourage more support for your church. Check out these best practices to get started on yours today! How to Thank Your Church for Their Financial Support: 5 Easy Ways! God calls all believers to give to their church. But this doesn't mean your church shouldn't say thanks. Here are five easy ways you can express your appreciation. Instead of letting your offering slide by as an afterthought, here are 11 things you can do to improve the offering in your church. Local pastors share six ways you can increase the number of recurring givers in your church. Learn five ways you can engage givers in your church throughout the week. Talking about money in the Church is hard. Here are six hard truths about giving you need to know. Have questions about Tithing? We've got answers in this post about frequently asked questions about tithing and giving. Here are eight tips to help you increase online giving in your church. Here are three key findings from Dunham+Company, as well as a list of online giving best practices. The way people make donations continues to change. Here are 4 trends your church needs to know based on the 2017 “Charitable Giving Report” by Blackbaud Institute. Christian quotes fro influential people that inspire us to use our money well and be generouse people of faith. Use them for taking tithes & offerings, serrmon quotes, bible studies, devotions and more. Email is a tried and true fundraising tactic that churches need to understand. Generate better responses and increase giving at your church with these helpful tips. Making it easy for peopel to give financially is important to the long term health of your church! Use a Giving Kiosk, strategically places, to enable simple giving on site. Looking to use social media to meet fundraising goals? Although social platforms change regularly, the way in which we use them remains the same. Here are six tips for boosting social media fundraising. To help you understand stewardship in the Bible, we review the biblical texts on stewardship and examples of stewardship in the Bible. Mobile giving is here .. and your church would be wise to understand the importance the impact on giving and generosity. This end of year fundraising email template is perfect for churches and ministries. Send it in December and raise more funds! The end of the year is coming to a close. Keep in mind that people are ready to give for many reasons. Use this end of year giving tactic to boost generosity. It’s vitally important to think through your online giving launch communications plan so that you reach as many people as possible. These expert tips will give you a roadmap. Proven tips on raising money during the Christmas Season for churches and Ministries. Raise money for a special offering or regular tithe. Looking for an online giving tool for your church, but unsure how to pick the right one? Here are a few key things you should consider when evaluating online giving companies. Can I “Tithe” to Parachurch Organizations? Generosity and giving is important and biblical, but as a Christian, is giving to a religious organization or parachurch the same as giving to a local church? Religiously affiliated people more likely to donate, whether to place of worship, church or other charitable organizations. Giving USA Church. Are you satisfied with what you own? If not, then you’re not alone. Stealing is a problem inside and outside of the church. The existence of stealing within the church is an unfortunate situation, but it happens and needs to be prepared for. Fall is upon us, which means it’s back to school for many. As the church, this is an excellent time to meet the practical needs of your community. Learn more! Founded in 2004, Cornerstone Community Church is a young church located in the rural mountains of Virginia. Click to see how they grew giving with Tithe.ly! Online church giving and superstition go hand and hand. How to get Your Church to use Tithe.ly and Mobile Giving? Use these proven tips, ideas, and examples when launching a new giving platform to your church members. What does it look like to be generous online in 2017? Nationwide survey shows many churches saw declining or flat giving in 2015, while at the same time seeing the need for modern digital giving solutions. If you’re planning on joining the crowds this Black Friday here’s some pro tips to help you have the best Black Friday shopping experience. There are also many other ways you can express gratitude and generosity this season. Here’s a few ideas. There are a number of churches who have been blessed with resources, and talented artists and creatives. They create amazing and beautiful sermon series, websites, print collateral, and their social media accounts look like they could be run by Fortune 500 companies. Use this guide when rolling out a mobile giving solution to your church for the first time or going through a technology upgrade. The 5 Tips Outlined in this post will greatly improve sucess.